Given the pullback in consumer and corporate spending, and it should not be surprising to see Big rise in unoccupied office space. Office vacancies rose sharply in the first quarter, a trend that is expected to continue as a result of layoffs and new construction adding to supply. According to the real estate services firm Grubb & Ellis, first-quarter office vacancies rose to an average 13.6% nationally, up from 13% in the previous three quarters. “With demand turning negative at the same time that the construction pipeline will deliver the 94 million square feet still underway, vacancy is expected to peak at 18% by the end of 2009,” Grubb & Ellis economist Robert Bach wrote in a research note today. 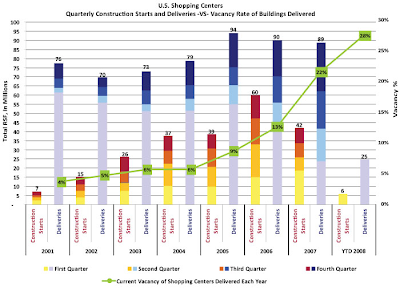 In addition, about 15.1 million square feet of new construction was completed during the first quarter. But net absorption—the amount of new space coming to market that found tenants—came in at a slim 1.8 million square feet. That’s the lowest rate of absorption since the second quarter of 2003, Grubb & Ellis said. Of the 57 markets tracked by Grubb & Ellis, vacancies rose in 42 locales and fell in 15. David A. Rosenberg, chief economist at Merrill Lynch is reporting Commercial construction boom turns bust. Commercial construction has rolled over, driven by the substantial tightening in credit conditions that started late last year. Banks materially tightened lending standards for commercial and industrial loans in the fourth quarter of last year, and by the first quarter they were at a historic high. The regression work we did earlier this year suggested that it took about 2-3 quarters for a tightening in credit to have an impact on building, and the rollover we’re now seeing is about right on cue. 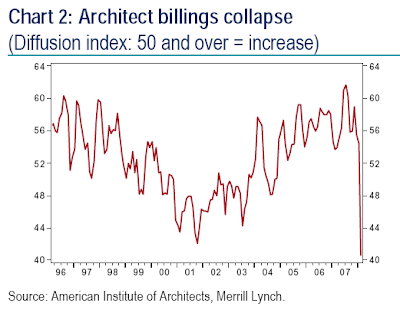 What tells us that the construction rollover is not an event on the horizon but a present day reality is the massive slide in commercial site payrolls since the end of last year and the unprecedented rollover in architect billings. 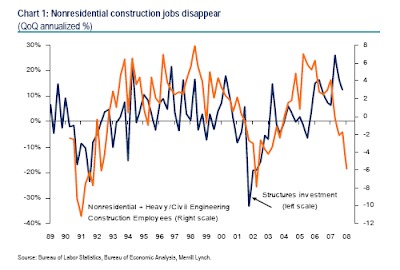 The nonresidential construction sector has shed 40,000 jobs since the end of 2007, the deepest cuts since 2002 when nonresidential building was posting double-digit quarterly declines. And, architect billings in the C&I space have been in free-fall since December – the three-month annualized rate was -77.4% as of February. Rich Toscano (aka Professor Piggington) is writing Employment Goes Negative. 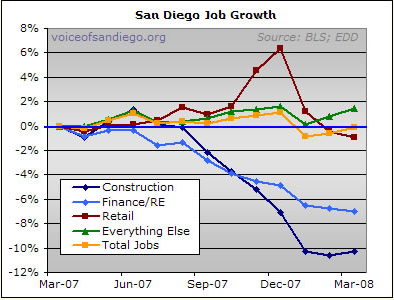 San Diego employment has just decreased on a year-over-year basis, falling by 1,700 jobs between March 2007 and March 2008. That is a very small drop in the grand scheme of things, representing a decline of just .1 percent. But it's the first time in a long time that employment has turned negative at all. The data I pulled from the Employment Development Department website goes back to the year 2000, and it shows that even during the recession and slowdown that took place at the beginning of this decade, the weakest month showed a year-over-year increase of 2,300 jobs. Mike Morgan provided a long awaited update on the Florida housing situation last weekend. I talked about it in Eye of the Housing Hurricane - Mike Morgan Update. Here is a snip about commercial real estate in Florida. Commercial and retail property are also becoming casualties in the back half of the hurricane. Drive through just about any Florida market to see all the For Lease signs on commercial property. Real-estate agents, lawyers, builders, contractors, mortgage brokers, insurance companies, furniture stores and all the rest are going out of business and leaving a flood of office and commercial inventory vacant. The condo market? Do you really want to hear anything about the devastation that the lenders and local municipalities are facing over the collapse of the condo market? That’s like adding a Class 5 tornado to the Category 5 hurricane over Florida. The hard evidence is now in. There can no longer be any denial about what is happening in commercial real estate. The above chart is from Shopping Center Economic Model Is History. Inquiring minds will want to take a look at the number of bankruptcies, unplanned store cutbacks, and the resultant glut of corporate real estate space presented in the above link. A wave of regional bank failures is headed our way because of leverage to commercial real estate. The Fed can do nothing to stop it.